A Log Stove Fire effectively binds a split log back together that stands upright. The bundling process creates enough air in the structure that it can burn effectively and create a hot and stable location to cook on. 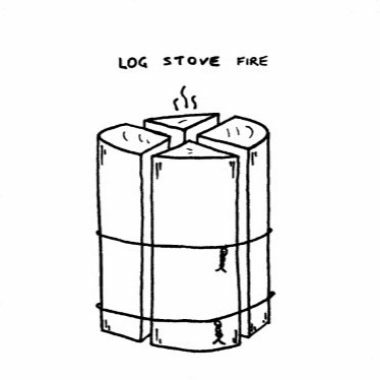 The Log Stove Fire is like the Stump Stove and Swedish Log Fire that have an upright feel, efficient use of firewood and good for cooking with pots and skillets on. However, unlike these two methods this one is easy to construct if you are at a camp site with axes/splitters, no special/power tools required. The log can be held together with wire or similar, alternatively it can be placed in a small drum or frame to hold the wood loosely together in an upright manner. 1/ Assess the location. Just because this fire is simple and portable doesn’t mean you can light it anywhere. As always consider the surroundings for fire hazards, wind direction and similar. 2/ Build the Bundle. 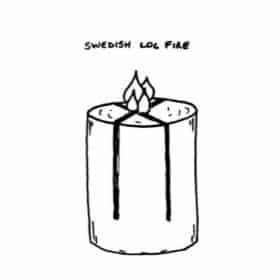 Find a large log and split it as if preparing normally for a fire. Loosely reassemble the log, but leaving airgaps in the reconstruction so that it can burn well. Using any preferred method, but wire works well, bind the wood so it is stable in this position. 3/ Lay the fire. 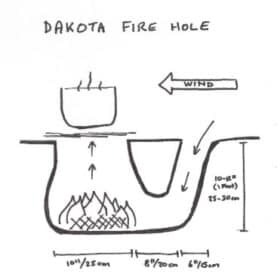 Tinder and small twigs are added into the bottom half of the log and down the hole created in the center, remembering to leave enough air to flow. 4/ Light the fire. Light the tinder at the base at least 20 minutes before you plan to start cooking on it. Once alight it will start to burn the log. 5/ Maintaining the fire. Unlike traditional fires, this fire has a specific amount of wood that will be burnt, once done, the fire is done. There is no wood tending required. 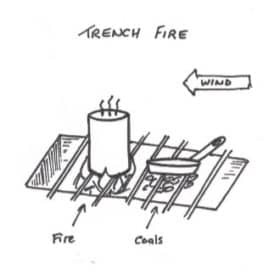 If having issues burning consider repositioning in relation to the wind to either remove strong wind in a lee, or place in a breeze of increase oxygen. 6/ Extinguishing the fire. This fire can be left to burn out into itself, or splashed with water to extinguish.